Do you know any children who love to dance? Introduce them to Little Piggy. Kids who haven’t yet discovered the joy of dance will also enjoy this hilarious children’s picture book! 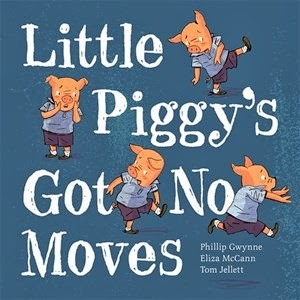 Little Piggy’s Got No Moves was written by husband and wife team, Phillip Gwynne and Eliza McCann, illustrated by Tom Jellett and published by Little Hare, an imprint of Hardie Grant Egmont (2013). Poor Little Piggy. All the other kids can dance. Mouse can do the macarena. Toucan does the tango. But everyone tells Little Piggy, “Us piggies, we’ve got no moves.’ Sadly, Little Piggy believes the bad press, and even though he goes to the school dance, he won’t join in. Until there’s a tail-twitching, toe-tapping moment and Little Piggy GROOVES! Kids will enjoy Jellett’s energetic illustrations, especially the many double page spreads of the townsfolk heading to the school dance. There’s a great refrain repeated throughout the story that children will love to join in. What fun they’ll have too, in trying out all the moves mentioned! And hopefully they’ll also realise how special and unique they are, just like Little Piggy. There’s lots of alliteration to find in Little Piggy’s Got No Moves. Can your children think of more dances that start with the same sound as an animal? For an easier challenge try to think of animals and actions that start with the same letters or sounds. Children will have a ball drawing and writing about side-stepping sandpipers and waggling wagtails, and the results would make a great collaborative, creative class book. Another book for my Amazon list. And I'll be able to completely sell it on the read aloud, because I have no moves, myself. Mooses (meese?) have moves! Sadly Book Chooks can only do the chicken dance, but I just know there's a Moose Move in you.